Glasses May Not Be the Best Correction for Short-sight. New research is showing promise that you can now slow down myopia in some children and teens, but not by using sight correcting glasses. If you have myopia, shortsightedness or near-sightedness, you will understand the frustration of not only needing glasses to see clearly, but also the frustration of knowing that your prescription often keeps getting worse from year to year. Myopia, also known as shortsightedness or near-sightedness, is a condition where the eyeball grows longer than normal, resulting in a loss of distance clarity. Near sight is often less affected, but this is not always the case. Myopia is a disease with serious ocular consequences as you get older – glaucoma, myopic macula degeneration and retinal detachments are some of the primary concerns. We must, therefore, treat its causes, instead of its symptoms. Myopia often starts around or just before puberty and can continue to progress well into adulthood, with some adults experiencing myopia for the first in their 40’s (this is different to the normal near vision problems that anniversaries of your 39th birthday produce!). Myopia is associated with intense close-work. Daily outdoor activity is associated with decreased severity of the myopia. There is often a strong family history of myopia. 15% chance if one parent is myopic, over 50% if both are myopic. Regular contact lenses and single vision glasses do nothing to stop myopia from getting worse. Treatments that help slow progression are now available at Harmony Vision. We have been actively involved in ways to slow myopia progression for more than a decade. If you or your child are seeking answers to questions about your changing sight, please call or email us today. Great progress has been made in myopia research in recent years, but there is still a lot to understand. Individual responses to treatments vary greatly and therefore can’t be guaranteed. Long-term data is currently being gathered to improve treatment outcomes. 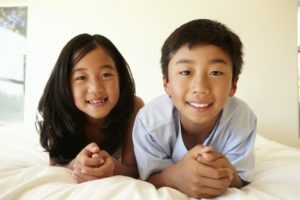 Myopia prevention is covered in detail at www.myopiaprevention.org.